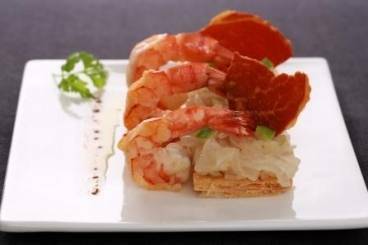 Puff pastry tarts with onions and Granny Smith apples served with grilled king prawns and crisp ham pieces. Lay the puff pastry between two sheets of baking parchment and sandwich it between two baking sheets. Transfer to the oven and cook for 20 to 25 minutes until golden brown. Cut the pastry into rectangles 4cm wide and 10cm long. Reduce the oven temperature to 160'C. Place the slices of ham between two baking sheets and cook for 10 to 15 minutes. Then allow to cool and then break into shards. Peel and finely slice the onions. Wash and dice the apple. Melt the butter in a saucepan and allow to turn a golden brown colour. Add the onion and a pinch of salt and cook for 2 to 3 minutes before adding a splash of water. Cover and cook for 20 to 30 minutes until the onions are soft. Check the pan regularly, adding a little water if necessary. Once the onions are soft, add the diced apple and season with salt and pepper. Remove the shell from the prawns, leaving the tail intact. Use the tip of a sharp knife to remove the black intestinal tract from each one. Heat a frying pan and add a splash of olive oil. Place the prawns in the pan and cook for 1 minute on each side and then season with salt and piment d'Espelette. Mix together the balsamic vinegar and the olive oil. Place a rectangle of pastry in the centre of each plate and then neatly top with the onion and apple mixture. Place the prawns alongside and then place a piece of crispy ham between each of the prawns. Finish with a drizzle of the vinaigrette and serve immediately.